Discover some of the main monuments of the Eternal City in the romantic atmosphere of times past. Some of the sights you pass by include The Fountain of the Nayads, The Exhibition Palace, Piazza Venezia with its Tomb to the Unknown Soldier and the Capitoline Hill. 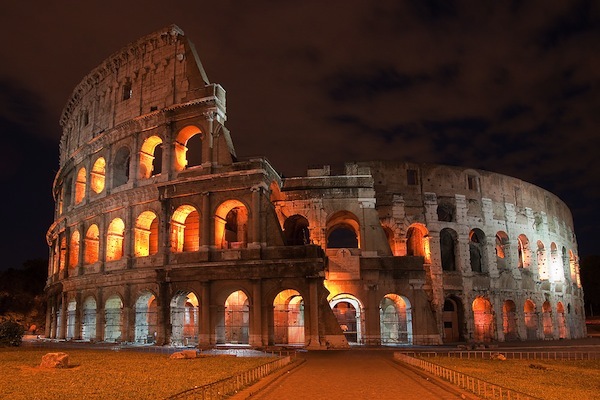 Glimpse the Imperial Roman Age as you drive by and admire the Roman Forum, the Colosseum, the Arch of Constantine and The Circus Maximus. Leap into the Papal era when, driving along the banks of the Tiber, you see the Jewish Quarter complete with synagogue and the imposing Castel Sant’Angelo closeby that heralds your approach to St. Peter’s. Set in the ancient Aurelian Walls that frame part of the Villa Borghese park, you’ll see a couple of the most beautiful gateways in Rome: Porta Flaminia through which you can admire the Piazza del Popolo and Porta Pinciana, through which you reach the famous Via Veneto symbol of “la dolce vita” in Rome. There will be two stops on this tour: at Piazza Navona to see the Bernini’s beautiful Fountain of the Four Rivers and at the Trevi Fountain so that you can keep up the tradition of throwing coins into the fountain. Return to the vicinity of your hotel. Length of the tour 2 hours.